Tissue converters from Europe, the Middle East and Africa can now source parent tissue reels from INDEVCO tissue mill in Egypt. Interstate Paper Industries (IPI) in Sadat City, Egypt recently launched operations and exported its first containers of jumbo tissue rolls to Saudi Arabia and Cyprus the beginning of July. The greenfield tissue mill will produce up to 30,000 MT of premium grade tissue paper annually using imported virgin pulp. Once the PM4 and deinking plants start up in Q2 2010, the additional 30,000 MT of production will rely on waste paper as raw material to produce recycled parent tissue rolls. Further, the mill's gas-fired power plant will be up and running in August, offering significant savings in cost of energy. "IPI is one major project that has been totally engineered and built using INDEVCO’s own internal resources. The key success factor has been the team approach adopted by IPI, Unipak Tissue Mill (UTM), Phoenix Machinery, PMD, and INDEVCO engineers, technicians, procurement and support staff. This team spirit will be further strengthened during the building and erection of PM4 (tissue machine)." PM4 is expected to start up in Q2 2010. 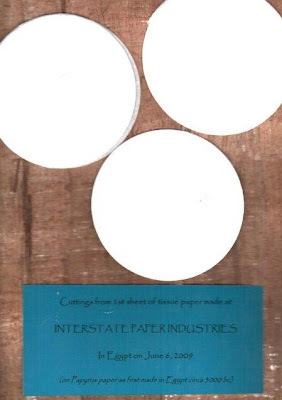 Interstate Paper Industries, along with Unipak Tissue Mill, is a member of INDEVCO Paper Making division.